Each of these queuing disciplines can be used as the primary qdisc on an interface, or can be used inside a leaf class of a classful qdiscs. These are the fundamental schedulers used under Linux. 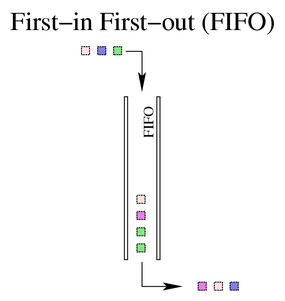 Note that the default scheduler is the pfifo_fast. This is not the default qdisc on Linux interfaces. Be certain to see Section 6.2 for the full details on the default (pfifo_fast) qdisc. The pfifo_fast qdisc is the default qdisc for all interfaces under Linux. Based on a conventional FIFO qdisc, this qdisc also provides some prioritization. It provides three different bands (individual FIFOs) for separating traffic. The highest priority traffic (interactive flows) are placed into band 0 and are always serviced first. Similarly, band 1 is always emptied of pending packets before band 2 is dequeued. There is nothing configurable to the end user about the pfifo_fast qdisc. For exact details on the priomap and use of the ToS bits, see the pfifo-fast section of the LARTC HOWTO. 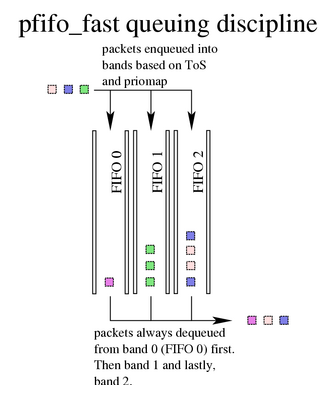 The SFQ qdisc attempts to fairly distribute opportunity to transmit data to the network among an arbitrary number of flows. It accomplishes this by using a hash function to separate the traffic into separate (internally maintained) FIFOs which are dequeued in a round-robin fashion. Because there is the possibility for unfairness to manifest in the choice of hash function, this function is altered periodically. Perturbation (the parameter perturb) sets this periodicity. Unfortunately, some clever software (e.g. Kazaa and eMule among others) obliterate the benefit of this attempt at fair queuing by opening as many TCP sessions (flows) as can be sustained. 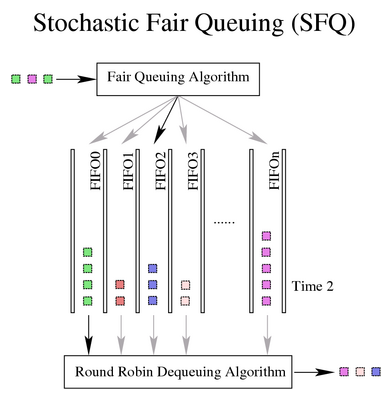 In many networks, with well-behaved users, SFQ can adequately distribute the network resources to the contending flows, but other measures may be called for when obnoxious applications have invaded the network. See also Section 6.4 for an SFQ qdisc with more exposed parameters for the user to manipulate. Conceptually, this qdisc is no different than SFQ although it allows the user to control more parameters than its simpler cousin. This qdisc was conceived to overcome the shortcoming of SFQ identified above. By allowing the user to control which hashing algorithm is used for distributing access to network bandwidth, it is possible for the user to reach a fairer real distribution of bandwidth. FIXME; need practical experience and/or attestation here. FIXME; I have never used this. Need practical experience or attestation. Theory declares that a RED algorithm is useful on a backbone or core network, but not as useful near the end-user. See the section on flows to see a general discussion of the thirstiness of TCP. This qdisc is built on tokens and buckets. It simply shapes traffic transmitted on an interface. To limit the speed at which packets will be dequeued from a particular interface, the TBF qdisc is the perfect solution. It simply slows down transmitted traffic to the specified rate. 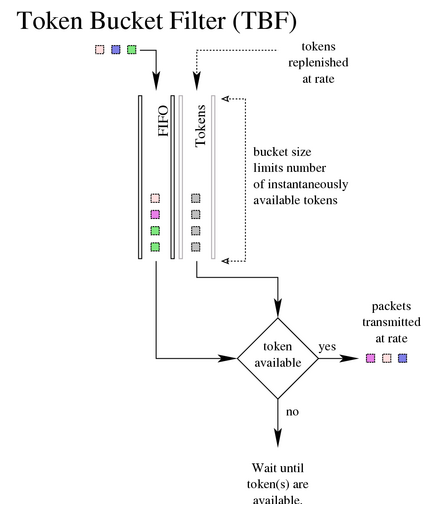 Packets are only transmitted if there are sufficient tokens available. Otherwise, packets are deferred. Delaying packets in this fashion will introduce an artificial latency into the packet's round trip time.